For those who served or loved their country dearly, our Brave Soldier casket spray will send them out with patriotic flair. Flowers in red, white, and blue stand out with pride and give a final farewell to those who have passed on. ** Customize this order by requesting your color palette ** Must call in this order to request your color palette. The Mourning Sunshine casket spray represents the sunshine they brought to your life. This casket piece will encompass the dazzling spirit that radiated from their being while consoling the hearts of those mourning the loss of a loved one. Featuring vibrant yellow spider mums and lilies with accenting pale green carnations, this spray can bring brightness to even the darkest of times. ** Customize this order by requesting your color palette ** Must call in this order to request your color palette. 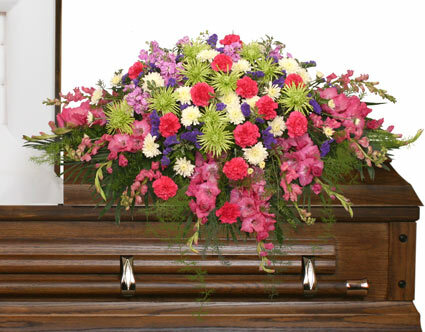 Price 1 - Half Casket Piece/More greenery and less flowers Price 2 - Full Casket Piece/As Shown Price 3 - Full Casket Piece/Additional Flower **Customize this order by requesting your color palette ** Must call in this order to request your color palette.